The European Commission is responding to the challenge of an ageing population with an ambitious initiative: the European Innovation Partnership on Active and Healthy Ageing. One of the key actions identified by the Partnership is the prevention of frailty in old age. 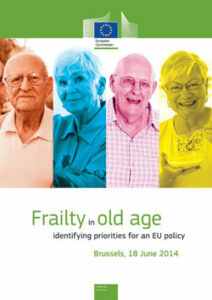 Building on this work, the European Commission is organising a second international conference on frailty in old age, entitled “Frailty in old age: identifying priorities for an EU policy”. The conference will take place in Brussels, Belgium, on June 18, 2014. The Conference is structured in three plenary sessions and three parallel workshops. In the morning plenary session, two key note speakers, Professor Kenneth Rockwood (Canada) and Professor Bruno Vellas (France), will argue and give evidence in support of an integrated approach to prevent and treat frailty. This session will be followed by a second plenary focusing on examples on how national, regional and international frailty strategies have been implemented or incorporated into the policy agenda. In the afternoon, three parallel workshops ‒ “Screening for frailty”, “Preserving independence of the old person: Physical activity, nutrition and falls prevention”, and “Clinical risk factors: cognitive decline” ‒ will allow participants to engage in more in-depth discussions on specific aspects of frailty risk factors and come up with concrete recommendations. The European Commission will close the conference drawing the key conclusions and highlighting milestones for future actions.